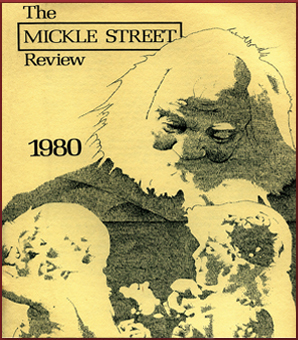 The second issue of the Mickle Street Reviewcontinues the project that was begun in the first: by encouraging poets and writers to draw on their experience of Walt Whitman and his work, the Review expects to demonstrate the continuing and ever-expanding influence of Whitman in American letters. Published from Whitman’s last home in Camden, New Jesrey, the Review offers a place in which writers can recognize in print the gratitude they feel toward Whitman and present those sides of themselves which Whitman’s work has helped to bring out. As we suggested in the preface to the first issue, the poem in homage to Whitman – in which a poet recognizes his or her poetic origins in Whitman’s work or in his persona – has become almost a sub-genre within American poetry. Though of course the same experience occurs with other poets than Whitman, with no other American poet does the discovery of the poetic self reach equivalent levels of frequency or intensity. In this issue, it is our design to present some of the forms which this poetic self-discovery can take. It is no accident that all of them are already implicit in Whitman’s own poems of self-discovery. Whitman’s sense of himself was constructed on a scale so large and inclusive as to comprehend nearly all of humanity. No reader can fail to find something of himself or herself in Whitman’s work; as Saul Bellow once said, a writer is simply a reader moved to emulation, and these writers have all been moved by some facet of Whitman’s personality to emulate that quality in themselves. The first of these versions of the self is the immigrant, a figure closely associated in Whitman’s poetry with humanity’s hope for a fresh start in a democratic nation free of the constraints of feudalism. That same hope is reflected by the mother of poet Stanley Kunitz in her memoirs, previously unpublished, of her arrival in America two years before Whitman’s death. But whether America will continue to think of itself as a “nation of nations” is a question raised by Will Inman, who sees in the plight of “boat people” a test of America’s ability to remember its own origins. But Whitman was also a poet of cities – the refuge and workplace of immigrants – and the change in cities between Whitman’s time and our own is a frequent theme of poets. In this issue, Joanne Seltzer and Norman McAfeeexplore the feelings of the self in relation to the changing face of American cities. Similarly, Whitman was a poet of poets, dreaming as he did of a nation of poets who, through their art, would move men and women to reach their full potentials (“a bard is to be commensurate with a people…I demand races of orbic bards, with unconditional uncompromising sway. Come forth, sweet democratic despots of the West!”). Kate Britt, Ken Fontenot, Judith Saul Stix, Richard Eberhart, and Theodore Weiss comment on the contemporary meaning of Whitman for American poets, while Alan Brilliant, whom many know as the editor of the Unicorn Press, relates the story of the contact with Whitman that made him a small press publisher. A feature of Mickle Street Review #1 was the long dialogue between Whitman and Gerard Manley Hopkins written byPhilip Dacey. In this issue, Dacey continues to explore the relationship between these two unlike men with an imaginary letter from Hopkins to Whitman. Similarly, John Gill gives us his version of an entry from the diary of Peter Doyle, the young streetcar conductor whom Whitman met in Washington during the Civil War, and whom he left to come to his dying mother’s bedside in Camden. The “calamus poems” which Doyle might have written had he been a poet complete Gill’s version of the relationship between Whitman and Doyle. But a different interpretation of Whitman’s sexuality is drawn by Jean Pearson, who finds in it an “androgynous” vision in which masculine and feminine principles are united in one person. Finally,Joseph McCullough, who recently bought a house in Whitman’s old neighborhood, imagines the poet waking from a long sleep and going for a walk in modern Camden. Perhaps the most abundant category of Whitman poems are those in which a poet is reminded – by the sight of the Civil War battlefield at Fredericksburg, by composting leaves, by the images of a summer day or the memory of a summer morning – of a phrase or mood which the poet associates with Whitman. Out of such reminders grow new poems, such as those by Dave Smith, Frank Allen, Jon Bracker, Daniel Wolff, John Appling Sours, and Joy Walsh. Such reminders often slip into parody, which we have generally avoided, with the exception of Harry Smith’s ironic “I Hear America.” Or they may take the form of deliberate efforts to evoke the continuing presence of Whitman in settings associated with him, as on Sidney Bernard’s walking tour of Whitman’s New York. Finally, in a new departure for the Mickle Street Review, we offer a scholarly study of the evidence that Whitman’s persona in the “Song of Myself” is alive, if not well, in modern fiction – specifically, Saul Bellow’sHenderson the Rain King. What is striking and disturbing in Thomas Friedmann’s study is not that there are parallels between the modern self and the self of Whitman, but – as several other writers in this issue also suggest – that the modern self finds it difficult to attain the “unconditional uncompromising sway” that Whitman attained, and on which he based his hopes for America as a democracy. The editors would like to acknowledge with gratitude the Sponsors of the Mickle Street Review, Mrs. Doris Kellogg Neale, Dr. Harold D. Barnshaw, Camden College of Arts and Sciences, and University College/Camden, both of which are divisions of Rutgers University.